Instagram’s API allows us to interact with data such as user info, media (photos and videos), likes, comments, and tags. For example, you can search for media around a specific location and filter the results by time. The API also allows us to post comments or like specific media. For now, only uploading media isn’t supported. You can always look at the API endpoints documentation if you want to know about the full functionality. There are two types of API calls you can perform with the Instagram API: Unauthenticated and Authenticated. Unauthenticated API calls only need the client ID, and authenticated API calls use OAuth, specifically OAuth 2.0. If you don’t know what OAuth is, check out this Introduction to OAuth 2 article on DigitalOcean. Before we move on, it’s important to understand that there are limits to this API. At the moment of writing of this article, you can only perform 5000 authenticated calls per token and 5000 unauthenticated calls to the API. This is regardless of the endpoint that you use, though there are specific endpoints each of which has its own limits. You can check out the endpoint-specific rate limits section in the limits page if you want to learn more. Needless to say, you need to have your own Instagram account in order to work with the Instagram API. 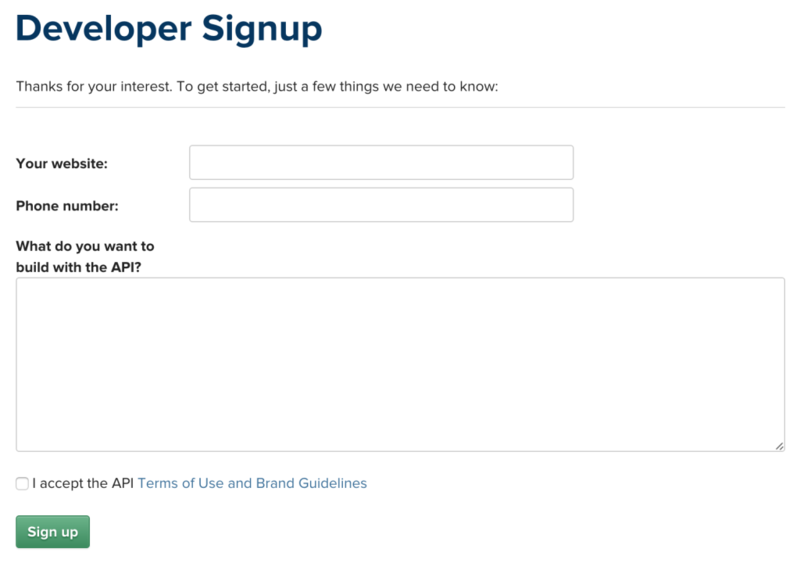 Then, sign up as a developer. If you have already created an app previously, then it leads you to the app management page which lists all your existing apps. From there, all you have to do is to click on the ‘Register a New Client’ button which would lead you to the same page as above. What this does is assign an HTTP and HTTPS URL to your Apache server running on localhost. You can then use the HTTPS URL for testing. Use this URL for the Website URL and Redirect URI fields in the app registration page. Once that’s done, just click on the ‘Register’ button to finish the registration. If all went well, you will be greeted with a client ID and client secret. We will be using these later on to perform requests to the API. You can use the API console to play around the requests which you can make with the Instagram API. 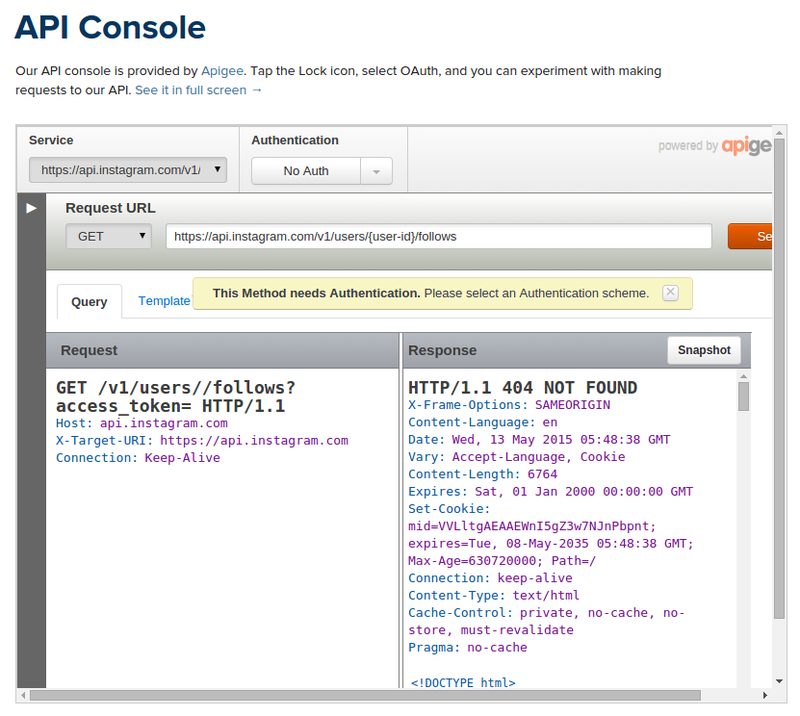 To use the API console, expand the API method selection menu on the left side of the console. From there, you can select a method you want to use for your request. Most methods require authentication so you have to select OAuth 2 from the Authentication drop-down and then sign in with your existing Instagram account. Do note that any requests you perform are performed on your behalf. This means that any action you do, such as liking a photo or following a user will be performed by your account. The API Console is pretty self-explanatory. You can select what type of HTTP request (GET, POST, DELETE, PUT) you want to use, enter the URL where the request will be submitted, and enter required query parameters. You can see the actual request and response that have been made after you click the ‘Send’ button. Optionally, you can install the Slim PHP framework if you want to follow along with the demo project. Note that we’re using version 5 of Guzzle because version 6 is based on PSR-7 and thus lacking many of the practical features of past iterations. If you want to use Slim, you need to install Twig, as well as Slim Views, so you can use Twig from within Slim. Next, add the client ID, client secret and redirect URL of your Instagram app. To get an access token, we first need to construct the login URL. The login URL points to the page that asks the user to grant permission to the app. The base login URL is: https://api.instagram.com/oauth/authorize. And then we need to pass in the client_id, redirect_uri, scope and response_type as query parameters. You already know what the client_id and redirect_url are, so let’s talk about the scope and the response_type. scope – this is where you specify what your app can do. Currently, the scopes available are basic, comments, relationships, and likes. basic is provided by default. This gives you read access to all of the API endpoints. The other 3, however, require your app to be submitted for review, because they allow your app to like, comment, follow or unfollow a specific user. response_type – the type of response we will get once the user grants permission to the app. On the server-side, this should be code and on the client-side this should be token. We’re primarily working on the server so this should be code. This means that an authorization code is returned after permission has been granted. Once the user has granted permission to the app, he will be redirected to the redirect URL that was specified. The authorization code is passed along with this URL as a query parameter. Next we need to make a POST request to the /oauth/access_token endpoint, additionally passing in the client ID, client secret, grant type, redirect URL and the code. The grant type is how the access token will be acquired after the user has granted permission to your app. In this case, we’re using authorization_code. This is the code that is passed as a query parameter in the redirect URL. Once the request is made, we convert the response from JSON to an array by calling the json method on the response. Finally, we render the view. Views in Slim are stored in the templates directory by default. Here are the contents of the home.php view. At this point you can now extract the access token and store it somewhere safe. Instagram didn’t mention how long an access token will last. All the documentation says is that it will expire at a time in the future. Therefore, we need to handle the event where the access token expires. You can do that by checking the error_type under the meta item in the response. If the value is OAuthAccessTokenError, then it means your access token has expired. You will only need to check for this item if the code in the meta item has a value other than 200. 200 means OK, just like the HTTP status code. 400 means error. The images.php view just loops through all the results that are returned and extracts the low resolution image URL. We then use that as a source for the image tag. By default, Instagram returns a maximum of 20 photos per request. 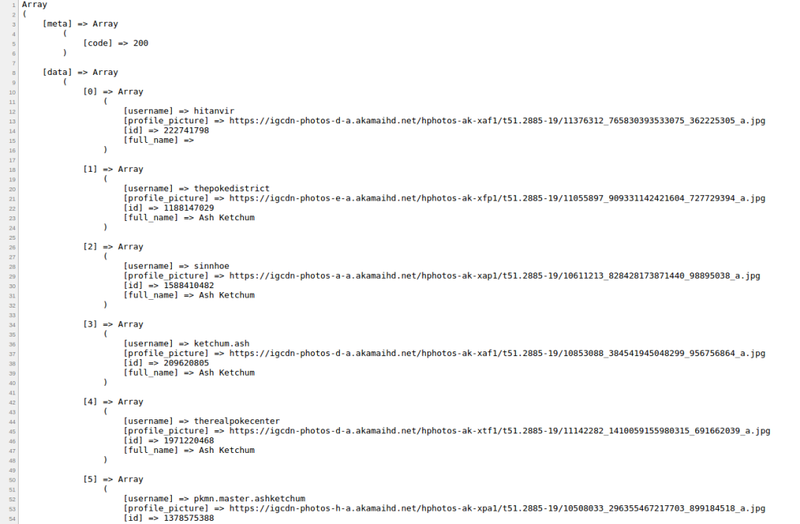 You can, however, specify the count as one of the query parameters to increase or limit the number of photos returned. The call above returns the username, id, profile_picture, and full_name of the user. Not all of the results are exact matches though. Note that you can also specify the distance, min_timestamp, and max_timestamp to this endpoint to further filter the results. The default distance is 1km and you can specify up to 5km. min_timestamp and max_timestamp are unix timestamps for limiting results to photos that were taken within a specific time period. You can use Carbon to easily generate timestamps based on user input such as ‘yesterday’, ‘5 days ago’, ‘1 week ago’. You may have noticed that the Instagram API already makes our life easy with pagination. If the results of a specific API call have a next page on it, you can just use the value of next_url under the pagination item as the URL to be used on the next request. This allows you to access the next page easily. Though do keep in mind that you need to store the id of the first item on the current page so that you can still access that page after you have navigated to the next page. If you want to make your life even easier when working with the Instagram API, there’s a PHP library called Instagram-PHP-API which provides convenience methods. To install it, execute composer require cosenary/instagram. The array argument is optional. It contains the scopes that you want to use. Pretty much the same as what we did earlier using Guzzle, only this time, we’re calling methods and the data that we need becomes readily available. You can get the user info by calling the getUser method. $user_id can be omitted if you only want to get the user info of the currently logged in user. If you use Laravel, someone has also created a Laravel Wrapper which uses this library. You can check it out here. 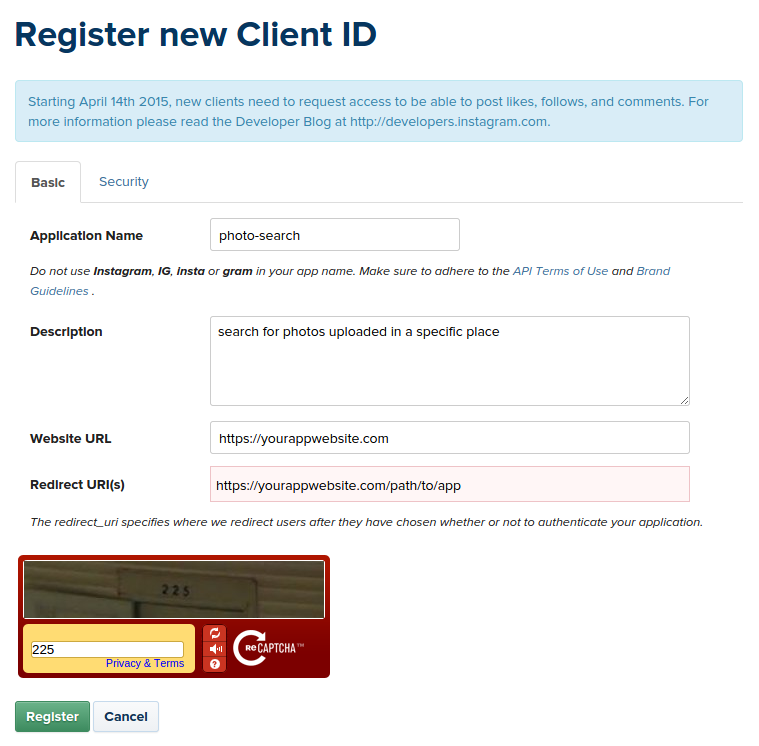 In this tutorial, we learned how to work with the Instagram API using the Guzzle HTTP Client and an Instagram client for PHP. 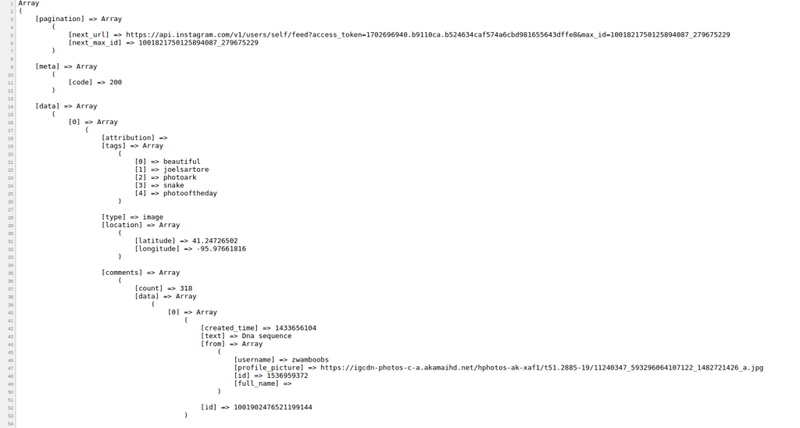 The Instagram API is a really nice way to interact with an Instagram users’ data. With it, you can build some really interesting applications. Have you built anything with the API? Do you prefer Guzzle or the Instagram PHP library? Why? Let us know in the comments!